Some Americans have this thing where they use mayonnaise in their salad dressings, which has always struck me as a bit counter-intuitive. Salads, supposedly light and refreshing, bogged down by all that claggy egg and oil. Don't get me wrong - I love mayonnaise, but mainly for dipping chips in, or swiping freshly peeled prawns through. Not to dress my greens with. I get the need for a creamier dressing, though. If this salad were to be dressed with an oil emulsion it just wouldn't be the same, it just wouldn't be as good. That's where yoghurt comes in - the thick, Greek-style stuff. Forget the 0% fat liquidy one - you need the creamy tang of the set yoghurt here. This salad is perfect alongside something like a baked pastry; I ate this with a spinach and cheese borek, with a little watermelon and feta to go with it. I used freshly podded peas and I think frozen will do, but wait for them to thaw out rather than actually cooking them in boiling water. And a note on the broccoli. I went to LA recently for just a day for work, and they really do eat raw broccoli as a crudité. Nope. That raw fluffy floret top - no, not raw. If you can handle it, then sure, but I prefer mine lightly blanched. 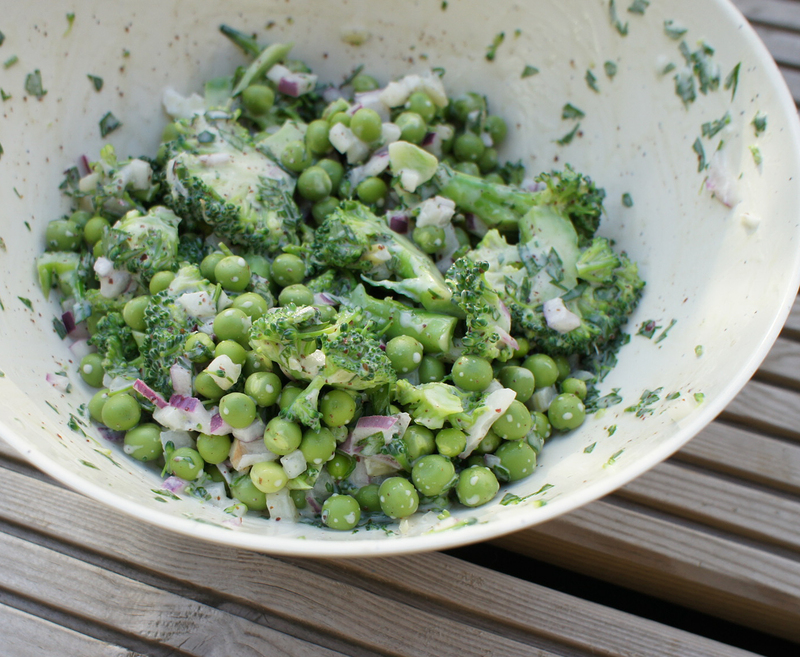 Chop the broccoli florets up roughly and add to the peas, alongside the pickled cucumber. Add the parsley in. To make up the dressing, whisk together the olive oil with the salt and the yoghurt. Add the pomegranate molasses, and then stir the cucumber in. Drain and rinse the red onion and add to the dressing. Cover the vegetables in the dressing and toss well, then sprinkle with the sumac and allow to sit for 10 minutes while the flavours meld. You are doing this punishment month AGAIN?! (the salad looks gorgeous though, and I love a yog dressing). You never should have told me that gem.. I'm gonna DECIMATE it!